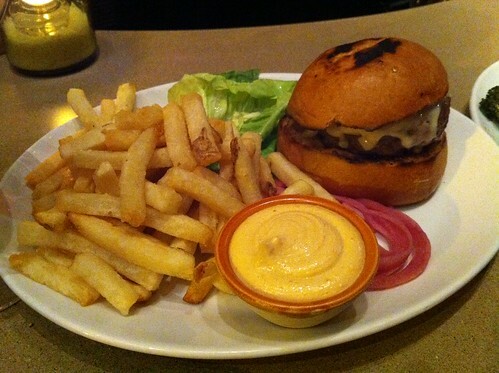 I closed with the classic: a medium-rare burger with gruyere from Nopa. As always, it was delicious. I hope you had some amazing burgers this week too. Until next year! Tried to go to NOPA, but they weren't serving food. So we went to the Bean Bag across the street. Quite tasty for the money, and they have $2 pints of beer. I'd forgotten how good their fries are. One day I'll try the NOPA burger, but who knows when that will be? Sorry to hear that, Graeme. Was it early or late? Give it another shot. It's worth it! I like Bean Bag too. Good for brunch and that's an amazing price for a pint. They can't get rid of me that easily, Todd! Especially when I see you & other locals checking in there pretty frequently... If it's good, I want some!